Gamers for Giving 2019 tickets will be available for purchase on Wednesday, January 16th @ 12 PM eastern time. All tickets can be purchased here. If you’re attending, please print and sign the event waiver, which can be downloaded here. Founded in 2008, Gamers for Giving is a competitive gaming tournament, streaming marathon, and LAN party that helps generate resources for the initiatives of Gamers Outreach. Hosted in Michigan, the event has become one of the largest independent LAN parties in the United States. 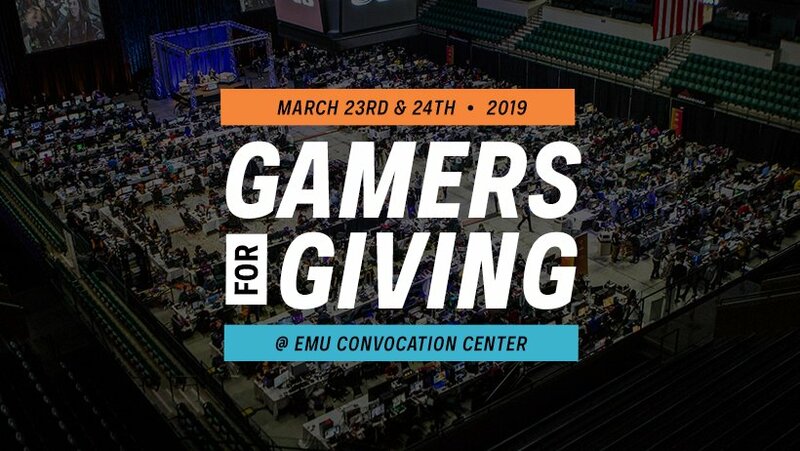 ﻿ Gamers for Giving 2019 will take place within the main arena of the Eastern Michigan University Convocation Center during the weekend of March 23rd & 24th. The event will also be streamed on Twitch.tv. Stream information can be found here.